Of what value is the Bible for anthropological research? Does it contain information that can be used to further our knowledge of ancient peoples? It sure does! An anthropologist reads biblical texts differently than a theologian, a Bible scholar, or a pastor. We read through the lens of cultural anthropology and we note details that are anthropologically significant. Such details include neolocal versus matrilocal or patrilocal residence; totemism, and relations between peoples in biblical lists such as those found in Genesis 10 and 36. We investigate data that enables us to gain a clearer picture of traditions and culture traits of very ancient people groups. 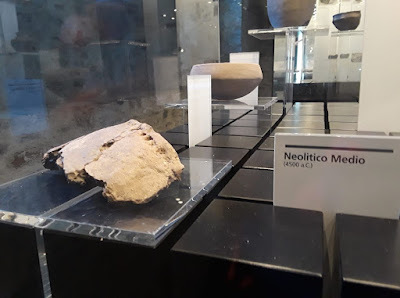 We gather data that helps us understand the antecedents of later cultural developments and we check this data against the evidence of archaeology, linguistics, genetics and climate and migrations studies. Often the biblical texts suggest a hypothesis that can be tested. This often leads to exciting new discoveries such as the Nile-Japan Ainu connection, Biblical Sheba and Nubia connection, and the Kushite-Kushan connection. Biblical Anthropology is a relatively new field which I have been pioneering for over 30 years. It is distinct from Near Eastern studies because it focuses on the oldest layers of Biblical material which have an African context, not a Near Eastern context. Perhaps the most significant application of anthropology to the Bible is the analysis of the kinship structure of Abraham's people whereby I have been able to reconstruct the unique marriage and ascendancy pattern of the Horites. This is where much of my initial research was focused. I have presented that in an essay titled "The Marriage and Ascendancy Pattern of Abraham's People." The first historical persons in the Bible are Kain and his brother Seth. They lived no more than about 8,000 years. These are the first rulers mentioned in the Bible and their lines intermarried as evidenced by analysis of the genealogical data in Genesis 4 and 5, which must be taken as a unit. 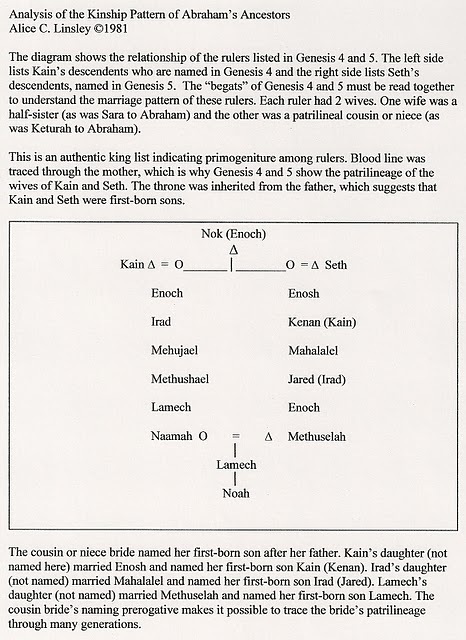 Kain and Seth married the daughters of a ruler named Enoch. The African name would be Nok. Nok is a person, a prehistoric site in Nigeria, and a sphere of cultural influence. The name is anachronistic in that the antecedents of the Nok culture are older than the material evidence indicates at this time. It is also possible that the names Nok and Enoch are derived from the African word anochi which means "one who is to rule." Clearly, Kain and Seth were not the offspring of the first humans who appeared on the surface of the Earth long before 10,000 years ago. This misunderstanding is due to a wrong interpretation of Genesis 4:1 which reads: The human knew Havva his wife, she became pregnant and bore Kayin. She said: "Ka-niti (Qanithi)/ I have gotten a man, as has YHWH." This is the first reference in the Bible to YHWH and the name is linked with ancient rulers. The Bible scholar E.A. Speiser noted that Qany(ty) or Qan-itti shows close affinity to the Akkadian itti, as in itti šarrim which means "with the king". Cain is associated with the concept of rule or dominion and throughout the Bible he is spoken of as a ruler. Genesis 10 tells us that Nimrod was a Kushite, so it is not surprising to find that Akkadian shares many words with Nilo-Saharan languages. Among the Oromo of Ethiopia and Somalia, itti is attached to names. Examples include Kaartuumitti, Finfinneetti and Dimashqitti. That itti is associated with Nilotic rulers is evident in the name Nefertitti. So the proper understanding of Genesis 4:1 is not that Eve gave birth to Kain, but that she knew she was giving birth to a ruler. A variant of Kain is Kahn, which also means king. What we have in Genesis 4 and 5 are king lists, and these are the oldest lists ever found. As was the custom of royalty until very recently, they married exclusively within their royal lines. The lines of Ham and his brother Shem intermarried according to the same pattern as the lines of Kain and Seth, as shown below. The lines of Abraham and his brother Nahor intermarried according to this same pattern. The pattern is found among these rulers. Each ruler had 2 wives. The wives lived in separate households on a north-south axis. One was a half-sister and the other was either a patrilineal parallel cousin or a niece. (Nieces were considered cousins.) The cousin bride named her first-born son after her father as this son will serve as a sort of prime minister in the territory of his maternal grandfather. The cousin bride's naming prerogative is first found here in Genesis 4 and 5 where we find that Kain and Seth's first-born sons are named Enoch after their wives' father. The pattern is revealed again in the data about Lamech (Gen. 4). 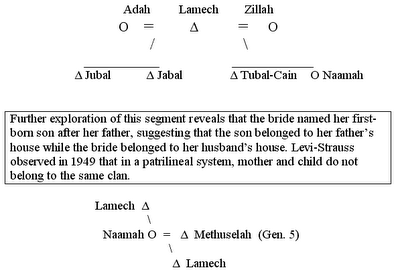 His daughter Naamah married her patrilineal cousin and named their first born son Lamech after he father. Lamech belonged to the household of Lamech the Elder, not to the household of his biological father Methuselah. Many of the names that appear in these king lists are royal titles. Enoch, Cain, Seth, Lamech are examples. According to Cassuto, "Lamech" is related to the Mesopotamian word ‘lumakku’, meaning “priest” (Commentary on Genesis, Vol. 1, p. 233). Terah, the name of Abraham's father, also means priest and is related to the Ancient Egyptian tera-neter. The intermarriage of the Horite ruler-priest lines appears to be unbroken from the Genesis kings to the time of Jesus. This endogamous pattern suggests that the Horites were a caste, rather than an ethnic group. Their ethnicity was Kushite and they dispersed into Arabia, southern Pakistan, India and beyond. However, their two points of origin were in Nekhen in Sudan and Wawat in Nubia.